The Miami Dolphins were founded by Joe Robbie in 1966. The Dolphins were a part of the AFL league between 1966 and 1969. With the AFL-NFL merger in 1970 the Dolphins became a part of what is known today as the NFL. The Dolphins play at Sun Life Stadium. It's a grass field that was open in 1987. It had a few name changes, first named Joe Robbie Stadium but later on Dolphin Stadium, Dolphins Stadium, Pro Player Stadium and Land Shark Stadium. Before that the team played in the famous Orange bowl. Mariners, Marauders, Mustangs, Missiles, Monns, Sharks, Suns. None of those names suggested to the AFL expansion franchise in 1965 could raise a fin to the runaway winner. "Dolphins" was submitted by 622 entrants in a contest which attracted 19,843 enteries and more than a thousand different names. The dozen finalists were delivered to a seven member screening committee of local media. The bottlenose dolphin, an intelligent creature with an irresistable built in grin, has inspired wonder for centuries. Plutrach observed 1900 years ago that a dolphin "is the only creature who loves man for his own sake." Every trainer will have a tale of the dolphin's cleverness and ingenuity, and scientists are fasinated by a dolphin's natural equipment which far surpasses the range of Navy sonar equipment. "The dolphin is one of the fastest and smartest creatures of the sea," Joe Robbie said in announcing the team name on October 8, 1965. "dolphins can attack and kill a shark or a whale. Sailors say bad luck will come to anyone who harms one of them." Mrs. Robert Swanson of west Miami won two lifetime passes to Dolphins games with her nickname entry. The tiebreaker was picking the winner and score of the 1965 game between the University of Miami and Notre Dame. It ended in a scoreless tie. 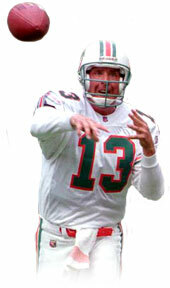 The club had a live dolphin, "Flipper", who was situated in a fish tank in the open end of the Orange Bowl during the team's early years, and "Dolfan Denny", who has prowled the sidelines for many seasons, including 1998. However, this marks the first time the club actually has an official mascot, one who participates in many of the team's programs in addition to his game-day activities. 2269 NW Dan Marino Blvd. Business Address 7500 SW 30th st.
Dolphins legendary QB Dan Marino, was the 27th player and the sixth QB taken in the 1983 draft. Elway, Blackledge, Eason, Kelly and O'Brien were picked before Marino. The player picked right after Dan was Redskin CB Darrell Green. Dan Marino hit Mark Clayton for 79 career TDs and the pair Marino to Duper connected for 55 TDs in their career.